Orakei maar and tuff ring in the Auckland Volcanic Field is an example of a basaltic volcano in which the style and impacts of the eruption of a small volume of magma were modulated by a fine balance between magma flux and groundwater availability. These conditions were optimised by the pre-85 ka eruption being hosted in a zone of fractured and variably permeable Plio-Pleistocene mudstones and sandstones. Orakei maar represents an end-member in the spectrum of short-lived basaltic volcanoes, where substrate conditions rather than the magmatic volatile content was the dominant factor controlling explosivity and eruption styles. The eruption excavated a crater ≫80 m deep that was subsequently filled by slumped crater wall material, followed by lacustrine and marine sediments. The explosion crater may have been less than 800 m in diameter, but wall collapse and wave erosion has left a 1,000-m-diameter roughly circular basin. A tuff ring around part of the maar comprises dominantly base surge deposits, along with subordinate fall units. 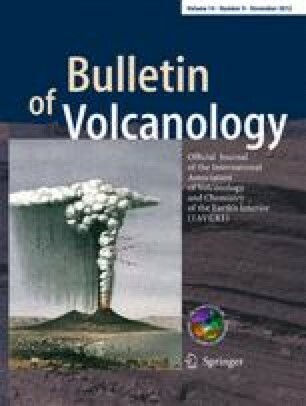 Grain size, texture and shape characteristics indicate a strong influence of magma–water and magma–mud interactions that controlled explosivity throughout the eruption, but also an ongoing secondary role of magmatic gas-driven expansion and fragmentation. The tuff contains >70 % of material recycled from the underlying Plio-Pliestocene sediments, which is strongly predominant in the >2 ϕ fraction. The magmatic clasts are evolved alkali basalt, consistent with the eruption of a very small batch of magma. The environmental impact of this eruption was disproportionally large, when considering the low volume of magma involved (DRE < 0.003 km3). Hence, this eruption exemplifies one of the worst-case scenarios for an eruption within the densely populated Auckland City, destroying an area of ~3 km2 by crater formation and base surge impact. An equivalent scenario for the same magma conditions without groundwater interaction would yield a scoria/spatter cone with a diameter of 400–550 m, destroying less than a tenth of the area affected by the Orakei event. The authors acknowledge support from the Foundation for Research, Science and Technology International Investment Opportunities Fund, Project MAUX0808 “Facing the challenge of Auckland volcanism” and KN was assisted by the Massey University Research Fund (RM13444). Prof. Claus Siebe and an Anonymous Reviewer provided helpful reviews and we also thank Editors Jeremy Phillips and James White for their contributions toward improving the manuscript.